The invention of Guy Julien and Christophe Millot, Wall-Ye V.I.N. stands 20 inches tall, travels on four wheels like a mini-tractor, and has two mechanical arms, the ends of which can accommodate a number of tools. It can handle manual tasks such as pruning vines and de-suckering grapes — both of which take a considerable amount of time and effort. Vineyard owners and managers can program Wall-Ye’s artificial intelligence to perform these and other tasks, including the collection of monitoring of information about plant health and the soil in which the vines are growing, according to its inventors. 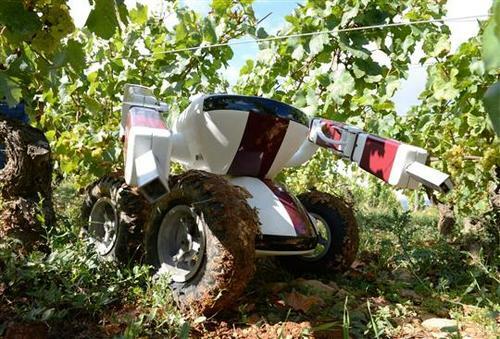 The Wall-Ye robot, the invention of Guy Julien and Christophe Millot, can travel freely around a vineyard and collect and record information about vines, including their location and health, courtesy of artificial intelligence. The robot also can replace humans for the labor-intensive tasks of pruning vines and de-suckering grapes. GPS, sensors, cameras, and mapping technology allow the robot to move between rows of vines, measure the distance between vines, recognize plant features, and record data. In this way, Wall-Ye also knows where it’s supposed to work, and it won’t start if it finds itself in the wrong place (for example, if it has been stolen). Wall-Ye’s inventors are taking it on a vineyard tour around Europe to demonstrate its merits to winemakers, who are finding it increasingly difficult to find the workers they need. Engineers and farmers are beginning to see the benefits of robotics in their picking and harvesting efforts. The Clever Robots for Crops (CROPS) program also is working to foster sustainable agriculture by creating an intelligent robotics platform that can identify and harvest specific types of crops, including wine grapes. The project, a collaboration among universities from a number of countries, is working on technology for a modular intelligent sensing and manipulation platform to harvest grapes and other “high value” crops, such as greenhouse vegetables and orchard fruits. Using robots for repetitive and laborious manual tasks also is the idea behind another machine we discussed recently: a Beijing chef’s noodle-slicing robot, which is now being used in restaurants in China.